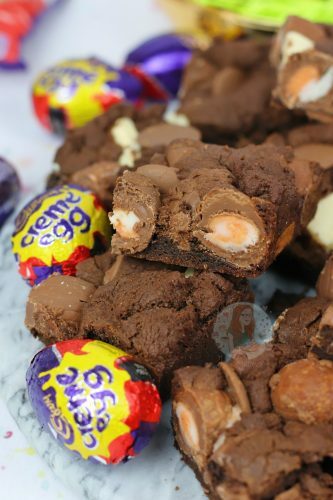 A Gooey Chocolate Chip Cookie Bar with Chocolate Chunks, and Mini Creme Eggs – Amazing Creme Egg Cookie Bars! HELLO YUMMY. Thought I would start this post off with the truth. This recipe is incredible. Not trying to blow my own trumpet too much here, but I really do think these are delightfully delicious, and perfect for all Creme Egg lovers everywhere. Think Gooey Cookie, along with a looooad of Chocolate to boot. I based this recipe very similarly on my M&M Cookie Bars recipe as its a really good chocolatey recipe. 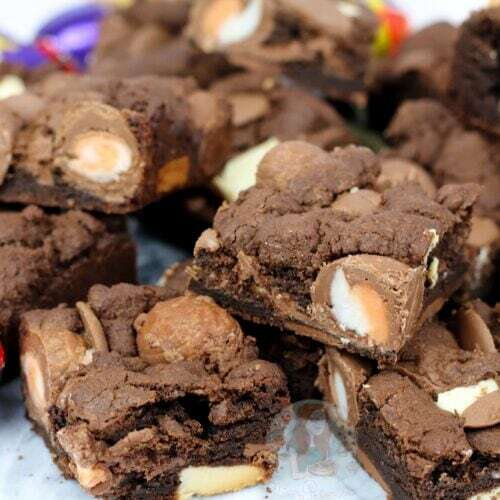 You can easily make these without the extra cocoa powder chocolatey part, just add in 75g more plain flour in place of the 50g of cocoa powder. I do admit that I prefer Mini Eggs to Creme Eggs (sorry in advance for that statement) but I do loooove Creme Eggs when they are involved in a bake. On their own I find them just a bit too sweet for my liking, but when they’re involved in a recipe I love them. Ironically even though a recipe often involves more sugar, and more chocolate, I find the Creme Egg not as sweet… oh well. My No-Bake Creme Egg Cheesecake, is one thats been a hit since I posted it. It’s a massive Easter Showstopper, but not everyone likes Cheesecake. The same with my Creme Egg Cupcakes, I adore them, but not everyone likes Cupcakes. However, in my opinion, everyone should LOVE Cookies. And you can’t beat ones that are super chocolatey and AMAZING. The Cookie Bars are easy enough but honestly, the ingredients are worth it. I realise it can seem like quite a few, but its a recipe that has developed over time and I just adore it. Its similar to a recipe that I would use for actual cookies, such as my Triple Chocolate Chip Crinkle Cookies, but with slight differences. I use more flour in these, and more cocoa powder, and then cornflour. The cornflour is important because it helps keep the dough thick, and not turn into a mess. I often think that the cookie bars need to be thicker a dough because they’re being more like a brownie than a cookie. I find these tastier and better than cookies. I mean, thats a strong statement, but if you’re eating a gooey one of these you fill full understand what I mean. You can see when the Creme Eggs start to catch the heat because they get a little bubbly on the top, and soon after they’ll burn. This is one of the reasons to freeze the Creme Eggs, as well as them being frozen means they’re much less likely to dissolve into nothing. 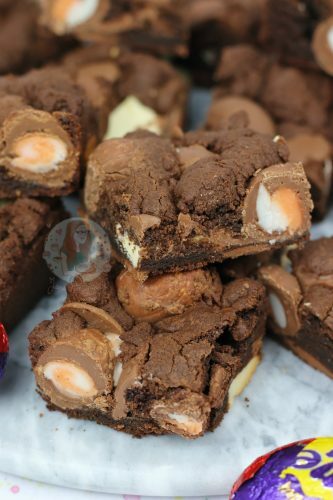 You can see how amazingly perfect they look in the pictures, and I can promise you its not nearly as nice with room temperature Creme Eggs! The extra chocolate in the Cookie Bars are optional, but I like having the extra flavours in there. It does mean that there is a lot of chocolate to push into the amount of dough there is, but its worth it. I do admit that I just smooshed all the cookie dough ingredients together, with the chocolates, with my hands, and it worked! 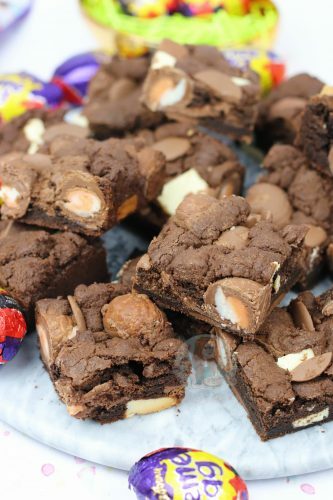 A Gooey Chocolate Chip Cookie Bar with Chocolate Chunks, and Mini Creme Eggs! If they aren't already frozen, freeze your Mini Creme Eggs overnight. In a larger bowl, melt the Butter. Add in the two Sugars, and whisk for about 2 minutes so the sugar starts to dissolve and the mixture is smooth. Add in the Egg and the Vanilla, and whisk again briefly till smooth. In another bowl, add in the Cocoa Powder, Plain Flour, Bicarbonate, Salt, and Cornflour. Whisk together till distributed evenly! Beat the two mixtures together. 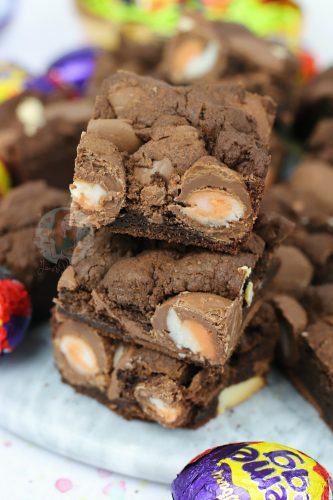 Add in your Chocolate, and the unwrapped frozen Mini Creme Eggs (and as the mixture should be quite dry) combine it together with your hands or a spatula. I used 4 of the Mini Creme Egg Bags as each has 8 Mini Creme Eggs in! These Cookie Bars are best whens lightly gooey. The Cookie Bar will look dry when baked, and won't wobble, but should be slightly soft when still pressed. Once cooled they will be ideal! 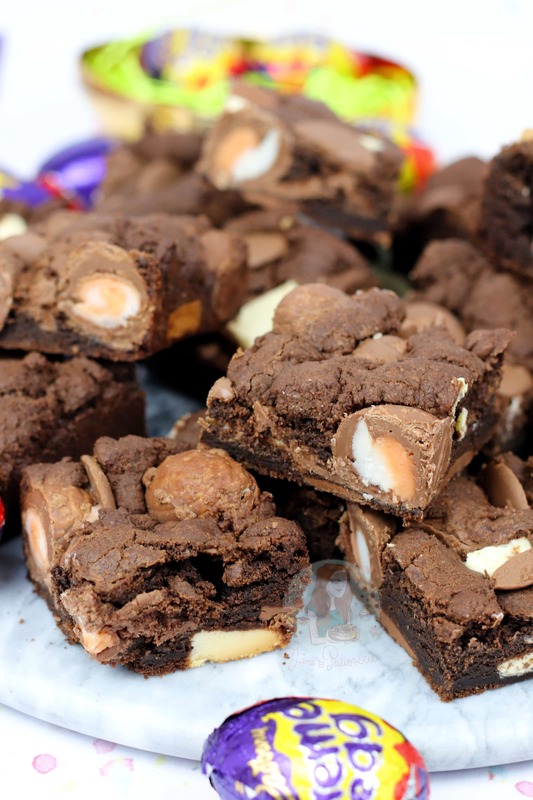 It's VERY important to freeze the Mini Creme Eggs before baking the cookie bars otherwise they might dissolve when baked. I used Cadburys Buttons for the other chocolate in the Cookie Bars. Find my other Cookie & Cookie Bar Recipes on my Recipes Page! Older Next post: Cadbury’s Caramel Cheesecake! Newer Previous post: Easter Chocolate Cake! I want to make these for a charity bake sale but how long will they keep in the fridge after baked or could I freeze them. I wouldn’t recommend fridging them as they will harden – but they’ll last 4-5 days once baked. You can freeze them raw and then bake, or baked and then thaw, but fresh is always better! Hiya! You can do but I would still recommend freezing them, and often the insides can explode in the big ones if chopped up as theres no shield basically, but it should be fine if frozen! These are amazing! I made them last night and they’re so delicious, major sugar overload, but there’s nothing wrong with that right!? Hi you have put unwrapped cream eggs so do you leave the wrapping on? At what point do you add wet ingredients to the dry mixture? 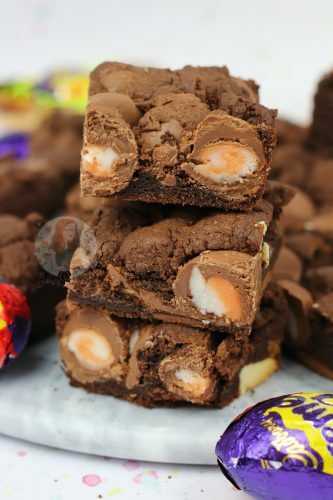 Is it before you add the chocolate and creme eggs?